Kenya Bixa embraces the idea of sustainable development in all its operations. We aim to positively impact the society’s-health, economy and support environmental conservation initiatives. The company embraces the idea of continuous Improvement in its production systems, technologies and products which are environmentally friendly. The bixa seed waste is used as raw material for Biogas production which is one of the energy sources for factory operations. The bixa seed waste is also used as raw material in the production of Organic fertilizer(Fast Grow). The company embraces new processing technology and is collaborating with research partners in the area of Bixa plant breeding, Agronomy and post harvest storage. 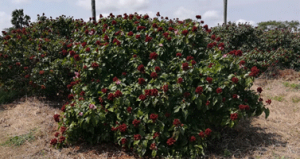 The company has its Annatto Nuclear farm of about 1500 Acres and a large number of out-growers supplying Bixa seeds through contract schemes. The company directly employs over 150 personnel and many more indirectly through contract farming, Annatto seed procurement, transport & logistics, education, water projects and community empowerment. Kenya Bixa Ltd offers opportunity for field attachment and internship to students from Universities and Tertiary institutions. The company actively engages the community in CSR activities including water projects.